Almost every day for the past 20 years, coffee has been a part of my daily ritual — and by “part of my daily ritual,” I mean the part that keeps me from being a sluggish, surly, cursing-at-passersby subhuman monstrosity. For the past three years or so, cocktails have also played a regular and significant role in that same routine. Yet, I’ve never had much desire to combine the two interests. When it comes to coffee and spirits, the usual offerings are, I find, depressingly uniform. Most drinks are either of the “fill a mug with coffee, add SPIRIT X and sugar (or, optionally, LIQUEUR Y) and whipped cream” variety, or involve combinations of chilled coffee or coffee liqueur, brandy, creme de cacao and possibly another liqueur or two. Not surprising, given coffee’s post-prandial popularity, but hardly the thing to send your tastebuds a-twitter. So, after Darcy’s decision to have Mixology Monday II focus on coffee (in all its various manifestations), I had to scratch my head and then go scurrying through the books in search of something interesting. 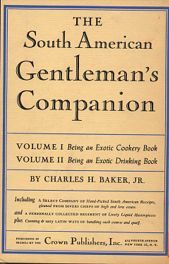 When “something interesting” is the operative search term in a cocktail quest, I’ve found that one of the best sources is Charles H. Baker, Jr. Traveler, writer and bon vivant, Baker was a magazine journalist for much of the first half of the 20th century, and he also authored two intriguing two-volume sets of food-and-drink recipes, stories and commentary: The Gentleman’s Companion, published in 1939, and The South American Gentleman’s Companion, in 1951. Ski Club Andino Boliviano’s HOT COFFEE-GROG, from the Club Chalet at foot of the SKI-TOW, some 18,000 feet above the Sea on Gigantic Mt. Chacaltaya, 40 miles or so outside La Paz, Bolivia. Put silver spoon in glass to prevent its cracking, pour in liquids, spice and sweetening. Stir with the cinnamon stick till sweet’s dissolved. […] A spiral of orange peel is sometimes added. We like that touch. How is this different from the coffee-spirit-sugar-etc. drinks I maligned above? Well, not a whole lot — except, the addition of spices ramp up the flavor quite a bit without contributing added sweetness, and even the 2 teaspoons of honey or brown sugar is fairly restrained, in terms of the dominant norm for coffee-based drinks. Naturally ordinary 86-proof rums rate small-beer beside the mule-kick hidden in a pot of 151-proof Demerara, so be careful as you pour or you’ll be shouting “Tim-BERRRRR!” as your guests topple and hit the tiles. For my take at this grog, I heed Baker’s warning and instead use 1 1/2 oz of the 80-proof Demerara, with 1/2 oz of the full-throttle variety to keep the flavor somewhat true to the original. I also replace the allspice and 1/2 tsp of the brown sugar with 1 tsp of Pimento Dram, as it’s pretty much the same thing — allspice & brown sugar in a Demerara rum base — that’s been allowed to mellow and marry for several months. But while Baker’s grog is a good fortifying drink to keep in mind the next time it turns frosty, another, somewhat-related beverage suggests a more exotic take on the coffee grog. In search of further coffee-drink-based excitement, I turned to the other name that pops into my head when thinking of interesting drinks: Jeff “Beachbum” Berry. In his Grog Log, Berry gives a recipe (without a source, unfortunately, beyond “circa 1950s”) for a Polynesian relative of Baker’s Coffee Grog. Heat and then ignite cloves, peels, Grand Marnier and rum in Pyrex saucepan or blazer pan of chafing dish. 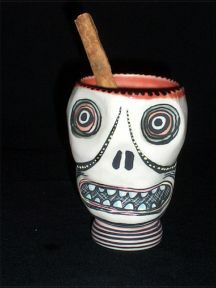 Fill skull mug 3/4 full of hot coffee, then stir in coconut cream. Spoon flaming mixture on top. Use cinnamon stick as stirrer. I found the coffee works well in this tiki environment, and the resulting drink is a far cry from the dull, dessert-tasting coffee cocktails you typically come across. Thanks to Darcy for coming up with the theme, and for hosting this edition of Mixology Monday. I look forward to reading the wrap-up in the next day or so. UPCOMING: Mixology Monday III will be upon us in June. The host for this edition will be Rick at Kaiser Penguin, and Rick has chosen mint as his theme for the month. You are tempting me beyond my ability, Paul. I will most likely have my stash of Demerara rum at the end of the month, and I’ve just been browsing the pages of Grog Log over and over again absorbing all of the exciting recipes I’ll get to try. Yeah, just don’t get a match too close to it–the last time I flamed rum, it was using the usual 80-proof variety at Christmas; when fixing the coffee grog with the Lemon Hart 151, I suddenly found myself facing a bouquet of blue flame, doing the quick math in my head on how much booze was in the pan while grabbing for the lid. You get bonus points for using cold coffee, and for using Rhum Agricole in your drink–once I pick up some (pretty hard to find in Seattle — I’ve seen St. James, but I’m kind of holding out for Neisson or La Favorite, as I had them at a tasting once and came away impressed), I’ll give the Black Rose a try.